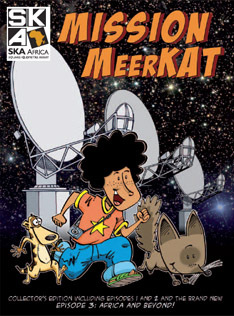 4 x 8 page comic books for SKA (Square Kilometre Array) and MeerKAT (the Karoo Array Telescope). An inquisitive school girl Hannah and the young astronomer Naledi are two key characters in colourful comic books developed to engage the public in the story of the SKA and MeerKAT. A real meerkat also features prominently, along with an adorable bat-eared fox – both animals found in the Karoo. The stories are set in and around a small rural town in the Karoo and help readers to understand how radio astronomy works and why the pathfinder telescope – and possibly later the SKA – will be built in the Karoo. Download the Collector’s Edition which includes all three episodes or each episode individually. A mobile open-source exhibition for the International Year of Astronomy! Making the universe everyone’s to explore. We’re bringing the universe closer to ordinary South Africans. Jive Media has produced a 10m long banner with the stunning images from deep space that are usually only available to those with internet access. This banner showcases space to the general public. Large, high resolution images of near and deep space will showcase phenomenon such as nebulae, supernovas, globular clusters and galaxies, in all their brilliance. Images of our sun, earth and moon as many have never seen them before, as well as the planets in our solar system, are also showcased. landed in W/Cape some years ago etc etc! Jive Media Africa conceptualised and produced, together with Madam & Eve, a national campaign for the total solar eclipse 2002. Print products and television inserts were distributed through most national newspapers and flighted on SABC Education respectively.